Butterfly Tenergy 05 is one of the world’s most popular table tennis rubbers. It has been around since 2008 and is used by lots of professional players. My review is more focused on what Tenergy 05 is like to play with from the perspective of an amateur player. It took me a while to buy my first sheet of Tenergy 05. I knew it was supposed to be a fantastic rubber, but I was always concerned that it would be a bit too lively for me. But in 2014, I decided to try it out and instantly fell in love with it. I have been using it ever since. In this review, I will give my overall impression of the rubber, then I will give feedback on how the rubber performs when doing various different strokes. So let’s get straight to the most important aspect of Tenergy 05: TOPSPIN. It’s a wonderful rubber to play topspin shots. I remember the surprise on my training partner’s face when I started using Tenergy 05. My stroke was the same, but somehow my shots had a lot more topspin. My training partner was surprised a rubber could make that much difference. But Tenergy 05 really does make a difference. My topspin shots instantly improved from decent to deadly. But – and this is a very important but – I have to make a good brushing contact with the ball. If I get a good contact I can generate huge amounts of topspin. But if the contact is not quite right, the ball will fly off the end of the table. So to get the best from Tenergy 05 I have to play with something resembling decent technique. Whilst Tenergy 05 is great for topspin attacks, it’s a bit more challenging for defensive play. I can push and block well with Tenergy 05 but my touch needs to be good. The margin for error is quite small. If I get my bat angle wrong, the ball can pop up, giving my opponent an easy ball to attack. Who should use Tenergy 05? 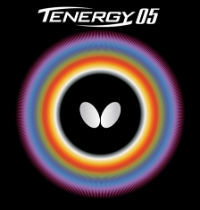 Tenergy 05 is most suited to advanced players, who like to attack with topspin. If you’re an intermediate player, who is developing a topspin playing style, then you could try it too. But if you are a cautious, all-round player, who likes to push and block, I don’t think Tenergy 05 will be right for you. Tenergy 05 is brilliant for topspin strokes. The rubber makes it easier to topspin backspin balls (pushes and chops). Sometimes I get a bit tense when attacking backspin balls, but even when I do tense up, I still manage to topspin the ball up over the net with decent spin. When I’m fully relaxed I can easily topspin the backspin balls with a lot of topspin. When playing topspin against block or topspin vs topspin, it also feels quite effortless to generate topspin. Tenergy 05 is quite springy, so I find I have to brush over the top of the ball to keep it in, especially if I am playing close to the table. If I’m a bit further back then there is a bit more margin of error and I can play some really nice loopy topspins which land deep on my opponent’s side of the table. Whilst Tenergy 05 is great for topspin, I don’t think it is so good when flat hitting. The ball really springs off the rubber, so it can be difficult to control the length of flat hits. Even when smashing high balls, I find that I overhit occasionally. Flicks are also very easy to do with Tenergy 05, especially if you like to flick with topspin. Most of the time, players will push short backspin serves, but Tenergy 05 makes flicking these serves easier to do. You still need decent flicking technique, but I find the rubber helps me grip the ball, spin it over the net and get the ball deep to put my opponent under pressure. Again, I have to get the brushing contact right. If the contact is too flat, I may send the ball long past the end of the table. I can block nicely with Tenergy 05, but I think there other rubbers which are easier to block with. Because the rubber is springy, I really need to close the bat angle when blocking. If I get the bat angle right, I can return my opponent’s attack with a lot of speed. But if my bat angle is too open, the ball can jump up off my rubber and shoot past the end of the table. So blocking can be very good with Tenergy 05, as long as I get the bat angle right. I sometimes find pushing a little tricky with Tenergy 05, especially with the forehand. The springy rubber can make the ball pop up when pushing. So I have to adjust my stroke a little bit and not brush under the ball quite so much. If I use soft hands and play a confident push stroke, then I can push fine with Tenergy 05. But if I prod at the ball a bit passively, then the ball tends to come off the rubber a bit too high. Tenergy 05 certainly wouldn’t be my first choice of rubber to chop with. It’s not designed for a chopper. But you know what? If you get the contact right, you can play some really wicked chops with Tenergy 05. Huge amounts of backspin. The trouble is trying to do it consistently. I have to work quite hard to chop well with this rubber. Even when I get into a chopping rhythm, maybe only 1 in 4 is a really good chop. I can generate lots of spin when serving with Tenergy 05. It doesn’t matter if it’s sidespin, backspin or topspin – I can get good spin on all my serves. I do find it easier to do long, spinny serves with Tenergy 05, compared to short, spinny serves. It is possible to do short spinny serves, but because the rubber is springy, I need a very fine brushing contact to keep the ball short and spinny. I find it a bit more challenging to keep serves consistently low over the net with Tenergy 05. I am able to do it, but I really have to keep focused. When I get the service right – low, short and spinny, it can cause opponents all kinds of trouble. If your game is more hit, than topspin, or if you like to push, push, push, push, then I don’t think Tenergy 05 is the right choice for you. But if you like to play an attacking topspin game (or aspire to play in this way), then Tenergy 05 may be the perfect rubber for you. You can generate huge amounts of spin. You can easily topspin over the table with backhand and forehand flicks. You can play topspin attacks close to the table and further back from the table. It’s the best rubber I have ever used for playing topspin. The drawback, is that Tenergy 05 can be a bit harder to control when pushing and blocking. You can still push and block very well with this rubber, but you need to get the bat angle right. The margin for error is smaller than other rubbers. The price for Tenergy 05 is expensive. At time of writing, Tenergy rubbers cost more than any other rubbers. But the quality is excellent. And if you like to play topspin, then Tenergy 05 really is as good as it gets.